During a long chat between New York City and Berlin, longtime friend of my wife Marilyn, pianist and teacher Lynn Rice-See, answered two questions of mine. These answers were 1) Bartók and 2) arch form. 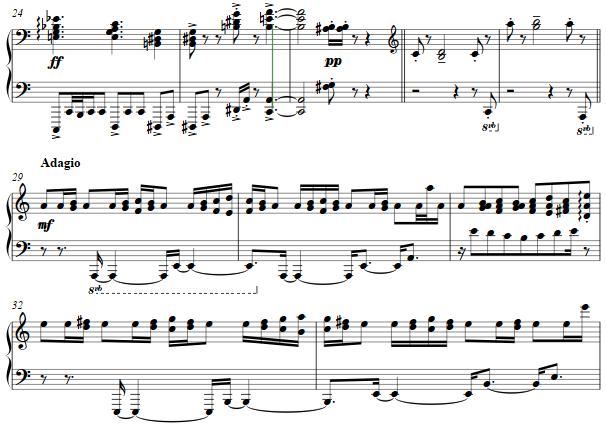 For the fun of it, this little piano piece is the outcome. Given the light-hearted pun on the name, musical materials are gleaned from Bartok, beginning with the often used 3+3+2 division as found in his Mikrokosmos and elsewhere. Other gestures populate the first section. The second section is a fugue of sorts, the subject referencing directly the "arch," a palindrome device. For this, a "modulation" takes the simplest A-B-A and moves it to the relative minor. Thus, A-B-A is followed by A-B-C-B-A, followed by A-B-C-D-C-B-A and then reversing to the first, a proper palindrome, a basic arch of little arches. The answer in the fugue is in its dominant as might be expected, with episodic material also related to arches, and then a final statement returns the overall work to its original tonic, as yet a larger instance of the arch. And why not?